Earlier this week, the Ottawa Senators finalized a trade that made the team older and more expensive. When discussing the Derick Brassard for Mika Zibanejad deal, general manager Pierre Dorion spoke about his desire to make a playoff run this season. At first glance, you would assume that’s a little foolhardy for a franchise that finished well out of the playoff last season – a team that doesn’t have a roster that is overly impressive. But when you look at Ottawa’s prospect pool, you begin to see that the future might be now for the franchise. Aside from Thomas Chabot and maybe two or three forwards, there really isn’t a lot for fans to be excited about. In Colin White and Logan Brown, the organization has two centers to look forward to, but quite frankly not many other prospects that look like they’ll be an impact at the NHL level. With that said, let’s take a look at the full prospect depth chart for the Ottawa Senators. The organization’s top-2 prospects are down the middle and that’s not a bad place to start. After an outstanding freshman season at Boston College, 2015 first rounder Colin White looks like he is the future top line center for the Senators. White looks like a steal at 21st overall and had he been healthy during his draft year, there is likely no way he would have fallen to the Sens. He is a very fast, very intelligent two-way center that any team would love to build around. He’s a lot like Dylan Larkin except he actually backchecks and plays responsibly in his own end. 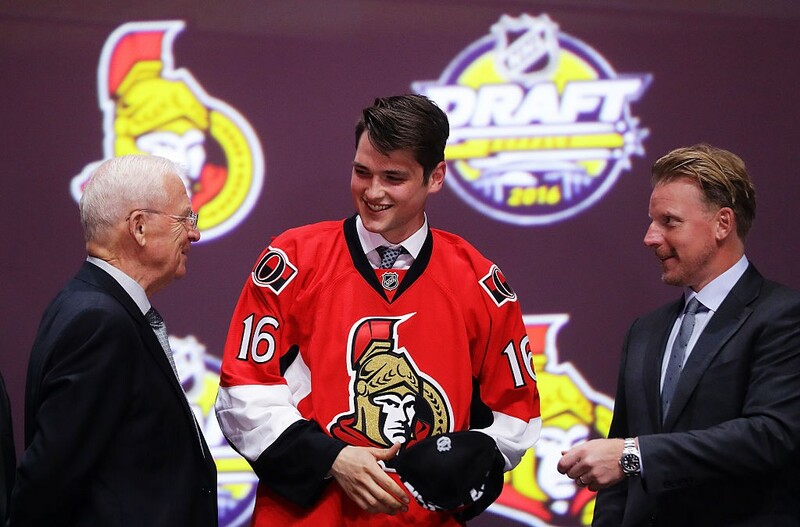 The Senators doubled down on American centers this summer when they drafted Logan Brown 11th overall. Brown was seen as a mid to late first round pick after a horrible opening half of the season in Windsor but saw his draft rankings climb as he turned his season around – culminating with a dominant performance at the U18 tournament. At 6’6, Logan Brown is a huge center that is hard to play against. Brown has a very nice shot but is much more of a playmaker than anything else. Slotting in as a second line center behind White in a few years is the ideal spot for a guy who might not have the high-end ceiling of some of his draft peers. It would be wrong to say Brown and White are the only two prospects that have a chance to be top-6 players at the next level. Jonathan Dahlen is a guy who many onlookers thought was undervalued in this year’s draft and Filip Chlapik has a lot of work to do on his game – but both could end up surprising in the future. Beyond the two big centers and the two question marks, there’s not a whole lot else. Guys like Puempel & Paul can be very nice bottom-6 wingers at the NHL level, but shouldn’t be expected to be anything more. If Nick Paul is in your team’s top-6, you’re not a very good team. This is where things get scary. The Senators spent their first pick in 2015 on Thomas Chabot. He is a solid two-way defender that has made huge strides each of the past two season and should be a very good NHLer if he continues his development trajectory. That’s it. Sure there may be surprises but Chabot is really the only one in the group that has a chance to be anything more than a 3rd pairing defender in the NHL – and that should scare the organization. In terms of goaltending there, is not a lot to write home about. After being a prized NCAA UFA signing last year, Matt O’Connor was very underwhelming during his first season in Binghamton. He and Chris Driedger will split the starts in the AHL again next year and the hope is that one takes the step necessary to be viewed as a legitimate prospect to one day be the organization’s NHL starter – although I wouldn’t hold my breath. Joey Daccord and Marcus Hogberg provide depth in the organization but Daccord is a long shots to every be anything more than filler in the AHL and ECHL. Hogberg is a guy that many believe has some potential but he will have to play a game of North American pro hockey before he can be anointed a legitimate prospect.